About | Russell M. Blood, PC | Russell M. Blood, P.C. After obtaining a degree in Economics from Brigham Young University, I returned to my Wyoming home and earned my law degree from the University of Wyoming in 1982. I began practicing law in Casper, Wyoming that fall and spent the next 18 years working and raising my family there. My practice included work in the areas of estate planning, business organization and planning, real estate, and contracts. I served in several positions with the Wyoming State Bar, of which I remain a member, and for a time as general counsel to the Wyoming Association of Realtors. We followed our two older daughters to Utah in 2000 to be close to our family and grandchildren, and established my law practice in the southern part of the Salt Lake Valley. Since coming to Utah, I have invested significant time and resources into deepening my knowledge of estate planning and business organizations to enable me to better serve the planning needs of my clients. 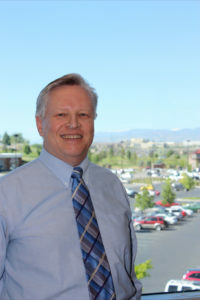 I am a past chair of the Estate Planning Section of the Utah State Bar and a Member of Wealth Counsel, a national organization of estate planners who share resources and collaborate together to help clients solve planning issues. I am married to my best friend and sweetheart of 43 years, and have four children and 12 grandchildren. I enjoy spending time with my family, hiking in the mountains with my wife, and serving in my church. And I love a good barbeque in the summer, and sitting in the football stadium on sunny fall days. free initial consultation, call (801) 263-0132 or click HERE.